The U.S. education system is mediocre compared to the rest of the world, according to an international ranking of OECD countries. More than half a million 15-year-olds around the world took the Programme for International Student Assessment in 2012. The test, which is administered every three years and focuses largely on math, but includes minor sections in science and reading, is often used as a snapshot of the global state of education. 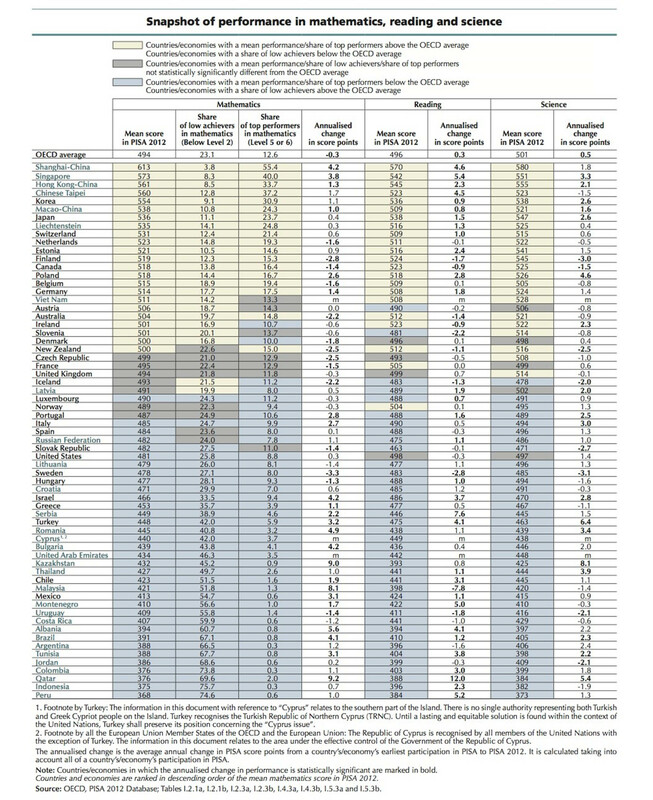 The results, published today, show the U.S. trailing behind educational powerhouses like Korea and Finland. Not much has changed since 2000, when the U.S. scored along the OECD average in every subject: This year, the U.S. scores below average in math and ranks 17th among the 34 OECD countries. It scores close to the OECD average in science and reading and ranks 21st in science and 17th in reading. 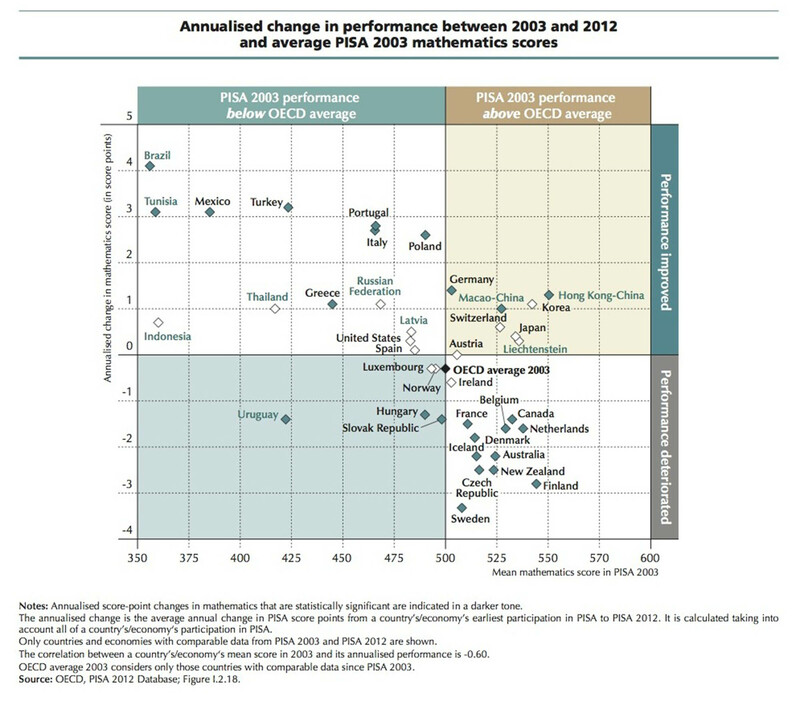 The U.S. scored below the PISA math mean and ranks 26th out of the 34 OECD countries. The U.S. math score is not statistically different than the following countries: Norway, Portugal, Italy, Spain, Russian Federation, Slovak Republic, Lithuania, Sweden, and Hungary. On average, 13 percent of students scored at the highest or second highest level on the PISA test, making them “top performers.” Fifty-five percent of students in Shanghai-China were considered top performers, while only nine percent of American students were. One in four U.S. students did not reach the PISA baseline level 2 of mathematics proficiency. At this level, “students begin to demonstrate the skills that will enable them to participate effectively and productively in life,” according to the PISA report. Even the top students in the United States are behind: This year, the PISA report offered regional scores for Massachusetts, Connecticut, and Florida. Massachusetts, which is a high-achieving U.S. state and which averaged above the national PISA score, is still two years of formal schooling behind Shanghai. Fifteen percent of the American score variation is explained by socio-economic differences between students. Less than 10 percent of score variation in Finland, Hong Kong, Japan, and Norway is due to socio-economic differences. The biggest annualized score improvements came from Brazil, Tunisia, Mexico, Turkey, and Portugal. Italy, Poland, and Germany also showed gains since 2003. How seriously should we take these dismal findings? Educators around the world have called for tempered reactions to the PISA scores and questioned the usefulness of the tests. Nevertheless, this year’s report—and the United States’ poor math results—may be worth paying attention to for at least one reason. A 2011 study found that PISA scores are an economic indicator: rising scores are a good sign that a country’s economy will grow as well.